In order for Project to successfully calculate costs for a project, you must enter accurate information, including varying pay rates. A work resource has a standard pay rate and an overtime rate. You can also enter specific pay rates for a certain day or for an assignment. In this module, we’ll look at resource pay rates, including material resource consumption rates. Finally, we’ll look at entering task fixed costs. Other tutorials cover adding resources and adding tasks to projects. For an instructor-led Microsoft Project training classes in Chicago and Los Angeles call us on 888.815.0604. Use the following procedure to enter pay rates. Select Resource Sheet from the View tab on the Ribbon. 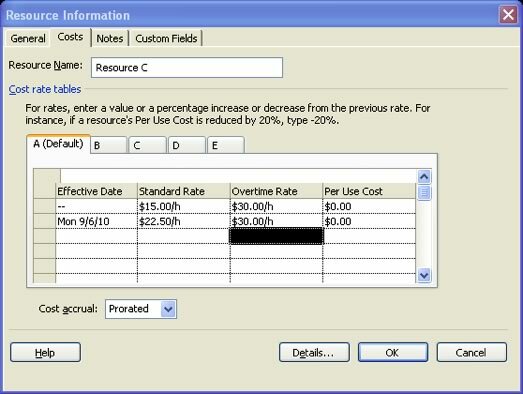 Enter the standard and overtime rate for each resource. To enter a pay rate for a specific date, use the following procedure. Double-click the resource whose pay rate you want to define to open the Resource Information dialog box. In the second row, enter the new standard, overtime, or a per use cost rate. Select the down arrow in the Effective Date column to select the effective date from the calendar. Click on a lettered tab to enter additional cost rate tables. A is the default table. Repeat steps 4 and 5 for each table. Select OK to closet the Resource Information dialog box. Download a trial version of Microsoft Project for FREE. View additional MS Project resources. 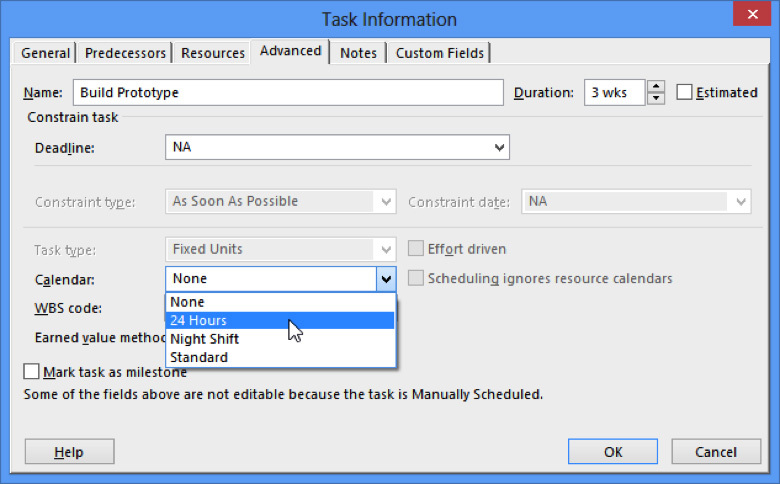 Select Task Usage from the View tab to open the Task Usage sheet. Double-click on the resource assigned to the task that requires a different pay rate. Project displays the Assignment Information dialog box. Select the Cost Rate Table that you want to use from the drop down list. To assign a material resource to a task, use the following procedure. Double-click on the task to open the Task Information dialog box. 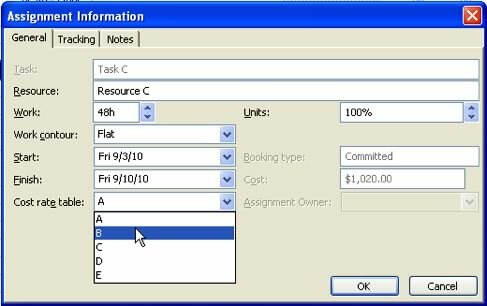 In this example, select Task E.
Select Resource E for the task. Enter 10 as the units for the material resource. Select OK to close the Task Information dialog box. Select Task Usage from the View tab. You can also manually override the calculated consumption rates by entering a new value in the columns for that resource for that task. Use the following procedure to enter task fixed costs. Select Table from the View menu. Select Cost. Enter the amount in the Fixed cost column. Also learn more about the Microsoft Project Interface. Every year we train thousands of satisfied students.... read a sample of testimonials at our Project training testimonial page.